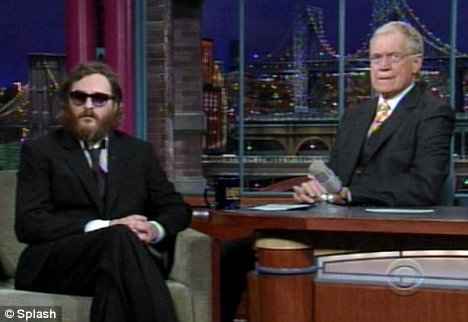 Joaquin Phoenix was bewildered and bewildering, a bedraggled, hairy mess on CBS' "Late Show With David Letterman" 19 months ago. The actor mumbled. He chewed gum. He stuck the gum under Letterman's desk. Many suspected Phoenix's weirdness was a stunt. Filmmaker Casey Affleck finally confirmed it the other day, telling The New York Times it was part of Phoenix's two-year on- and off-screen role of a falling star flaming out for Affleck's pseudo-documentary, "I'm Still Here." Affleck called it the performance of Phoenix's career. But will Phoenix be any more real when he revisits Letterman on Thursday night? Gabfests like "Late Show" and "The Tonight Show" haven't been forums for the famous to be themselves since the nights when Judy Garland would slur her way through an amusing Marlene Dietrich anecdote for Jack Paar.